For the administrative subdivision, see Brăila County. For the village in Chișinău municipality, Moldova, see Băcioi. 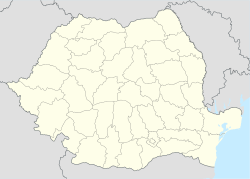 Brăila (Romanian pronunciation: [brəˈila] ( listen); Greek: Βράιλα; Turkish: İbrail) is a city in Muntenia, eastern Romania, a port on the Danube and the capital of Brăila County. The Sud-Est Regional Development Agency is located in Brăila. From left: Overview of the city (night view), Maria Filotti Theatre, Hotel Danubiu, Old town, Lyra Palace, Saint Nicholas Church, Headquarters of the Naval Authority, Traian statue. According to the 2011 Romanian census there were 180,302 people living within the city of Brăila, making it the 11th most populous city in Romania. Brăila in an early 1900s postcard. An overview of Brăila in late 19th century or early 20th century. Before 14th century, a small village existed in the place of today's Brăila, probably inhabited by fishermen and small merchants. The village fell to the Mongols during the 1241 Mongol invasion of Europe and it was under direct control of the rulers of Argeș in mid-14th century. A settlement called Drinago was found in several 14th century Catalan and Spanish portolan charts (Angelino de Dalorto, 1325/1330 and Angelino Dulcert, 1339), as well as in the Book of Knowledge of All Kingdoms. This may have been an erroneous transcription of Brillago, a name which was later used in 15th century traveller's journals. In Greek documents of roughly that time, the city is referred to as Proilabum or Proilava, a Greek language adaptation of its Slavic name, Brailov. In German language sources, it is mentioned as Uebereyl. The origin and meaning of the name is unknown, but it is thought to be an anthroponym. The first certain document mentioning Brăila is a privilege act, given by Vladislav I of Wallachia to German merchants of Brașov, who were exempt of customs duties when they followed the road from Brașov to the Danube via Braylan. Following the fall of Vicina, Brăila developed as the main harbour of Wallachia, gaining the town status around 1400. In 1396, Johann Schiltberger writes that Brăila was the place where ships docked, bringing "goods from heathen lands". Foreign merchants bringing goods were forced to unload their merchandise in Brăila, as it can be understood from a 1445 account of Walerand de Wavrin. A 1520 Ottoman account tells about the arrival of 70-80 ships in Brăila, bringing goods from Asia Minor and Crimea. The town was also an important center of the fish trade: Polish merchants came to purchase it (1408) and this lucrative trade was taxed by the rulers following Vladislav I. The town did have autonomy, being ruled by pârgari and a județ. We know little about the ethnic structure of the town, but it is expected it was quite diverse, having inhabitants from many backgrounds. One document from 1500 talks about Mihoci Latinețul, a Ragusan who had lived in Brăila for five years and was a member of the community. The conflict was not just political, as the town of Brăila competed against Moldavian town of Chilia. Nevertheless, Brăila recovered, soon becoming the gateway for Levantine goods into Wallachia. The town was burnt again by Bogdan III of Moldavia in 1512. Around 1538-1540 (perhaps during the Suleiman the Magnificent's military expedition against Petru Rareș), the city became a part of the Ottoman Empire, being organized as a kaza. The town was part of the Empire's northern defensive network and the Ottomans built a stone stronghold in the town. The Ottoman Empire ruled it from 1538–1540 until 1829; the Ottomans called it Ibrail or Ibraila. It was briefly ruled by Michael the Brave, prince of Wallachia (1595–1596). In 1711, the city was besieged and conquered by a Wallachian-Russian army during the Pruth River Campaign. In 1829, it was granted to Wallachia by the Akkerman Convention. During World War II, Brăila was captured on 28 August 1944 by Soviet troops of the 3rd Ukrainian Front in the course of the Jassy–Kishinev Offensive. Accessible to small and medium-sized oceangoing ships, Brăila has large grain-handling and warehousing facilities. It is also an important industrial center, with metalworking, textile, food-processing, and other factories. The naval industry is one of the focus of Brăila's revenue bringers. Brăila has the following areas: Centru (Center), Viziru (1, 2, 3), Călărași 4, Ansamblul Buzăului, Radu Negru, Obor, Hipodrom, Lacu Dulce, Dorobanți, 1 Mai, Comorofca, Calea Galați, Gării, Apollo, Siret, Pisc, Brăilița, Vidin-Progresul, Islaz and Chercea. The old center of the city has many 19th century buildings, some of them fully restored. The most important monuments are the Greek Church, erected at 1865 by the Greek community, the Sfinții Arhangheli Church, former jāmi during the Ottoman rule (until 1831), the 19th century Sfântul Nicolae Church, also from the 19th century, the Maria Filotti theatre, the Palace of Culture and its Art Museum, the History Museum, and the old Water Tower. The latter houses a restaurant and a rotation system (360° in one hour). Another important site is the Public Garden, a park situated above the bank of the Danube with a view over the river and the Măcin Mountains. Early in 2006 the municipality received European Union funds to renovate the old center of the city, aiming to transform Brăila into a major tourist attraction of Muntenia. The Church of the Holy Archangels is the oldest in the city. Begun in 1667, the former mosque was transformed into an Orthodox Church in 1808. Brăila features one of the oldest electrical tram lines in Romania, inaugurated at the end of the 19th century and still in use. Brăila's bus system is operated by the town hall in cooperation with Braicar Company, with four primary bus configurations available servicing most of the city. The city has several local newspapers, including Obiectiv-Vocea Brăilei, Monitorul de Brăila, Ziarul de Brăila and Arcașu'. It also has three television stations: Mega TV, and the local stations of Antena 1 and Pro TV. Wikisource has the text of the 1911 Encyclopædia Britannica article Braila.